Tropical Animal Science Journal (Trop. Anim. Sci. J.) previously Media Peternakan is a scientific journal covering broad aspects of tropical animal sciences. Started from 2018, the title is changed from Media Peternakan in order to develop and expand the distribution as well as increase the visibility of the journal. The journal is published three times a year in April, August, and December by Faculty of Animal Science, Bogor Agricultural University, associated with Animal Scientist's Society of Indonesia. The first edition with the new title will be published in April 2018 edition (Vol 41 No 1 2018), while the previous edition (up to 2017 edition) will still use Media Peternakan as the title and could be accessed in the old website (http://medpet.journal.ipb.ac.id/). This journal has been accredited by National Journal Accreditation (ARJUNA) Managed by Ministry of Research, Technology, and Higher Education, Republic Indonesia with First Grade (Sinta 1) since year 2018 to 2022 according to the decree No. 30/E/KPT/2018. Tropical Animal Science Journal has been indexed and abstracted in Elsevier products (Scopus, Reaxys), Clarivate Analytics products (Emerging Sources Citation Index), Scimago Journal Rank, ASEAN Citation Index, DOAJ, Dimensions-Digital Science, CABI, EBSCO, Science and Technology Index (SINTA), Google Scholar, and other scientific databases. The journal also used Similarity Check to prevent any suspected plagiarism in the manuscripts. Tropical Animal Science Journal receives manuscripts encompass a broad range of research topics in tropical animal sciences: breeding and genetics, reproduction and physiology, nutrition, feed sciences, agrostology, animal products, biotechnology, behaviour, welfare, health and veterinary, livestock farming system, socio-economic, and policy. Media Peternakan (MP) is a scientific journal covering animal science aspects published since 1967, and until now is consistently published three times a year in April, August, and December by Faculty of Animal Science, Bogor Agricultural University, associated with Animal Scientist's Society of Indonesia. MP is a peer reviewed journal that has been accredited by Directorate General of Research and Development Strengthening, Ministry of Research, Technology and Higher Education of the Republic of Indonesia since 2005. Media Peternakan has been indexed and abstracted in Elsevier products (Scopus, Reaxys), Clarivate Analytics products (Emerging Sources Citation Index), Scimago Journal Rank, ASEAN Citation Index, DOAJ, CABI, EBSCO, Science and Technology Index (SINTA), Google Scholar, and other scientific databases. The journal also used Similarity Check to prevent any suspected plagiarism in the manuscripts. MP receives manuscripts encompass a broad range of research topics in tropical animal sciences: breeding and genetics, reproduction and physiology, nutrition, feed sciences, agrostology, animal products, biotechnology, behaviour, welfare, health, livestock farming system, socio-economic, and policy. 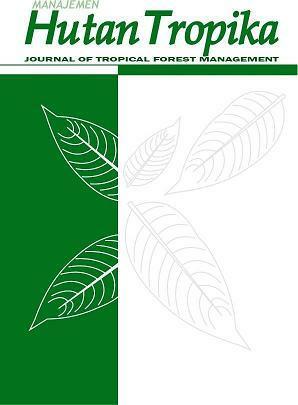 Jurnal Manajemen Hutan Tropika (JMHT, J Man Hut Trop) is a periodic scientific articles and conceptual thinking of tropical forest management covering all aspects of forest planning, forest policy, forest resources utilization, forest ergonomics, forest ecology, forest inventory, silviculture, and management of regional ecosystems. Jurnal Manajemen Hutan Tropika is published by the Department of Forest Management Faculty of Forestry Insitut Pertanian Bogor (IPB University). Jurnal Manajemen Hutan Tropika is indexed in Sinta (Sinta score = S1). Jurnal Manajemen Hutan Tropika re-accredited A from the Directorate General of Higher Education (DIKTI) through the Decree of Directorate General of Higher Education No. 36a/E/KPT/2016. Jurnal Manajemen Hutan Tropika also indexed in Emerging Sources Citation Index (ESCI) since Volume 23 Number 1 (2017). Since October 24th, 2018 Jurnal Manajemen Hutan Tropika accredited PERINGKAT 1 from the Directorate General of Research and Development Strengthening of Ministry of Research Technology and Higher Education of Indonesian Republic No. 30/E/KPT/2018. JTIP is published twice a year, i.e. in June and December. The journal contains research results and scientific review related to food science and technology as well as nutrition. In addition, it also covers various technological package for industry, short communication, and other information including promotion and advertisement pertaining the development in food science and technology from IAFT members and non members. JTIP is a peer reviewed journal that has been Accredited by Directorate General of Higher Education (DGHE), Republic of Indonesia No. 51/E/KPT/2017. Advertisement and promotion materials have to be received at the latest five weeks prior to the publication date. Advertisement may cover new products, process design and equipment or services related to the need of researchers and profesionals in both government institutions and food industries. Starting Journal volume XIX No 1, 2008 the ISSN of the journal has changed from 0216-2318 to 1979-7788. Also, reorganization in the management has been done during the first edition of the volume XXI to improve the performance of the journal. Jurnal Ilmu dan Teknologi Kelautan Tropis (JITKT), published since June 2009, starting in December 2010 was published in print and electronic. The name of E-Jurnal Ilmu dan Teknologi Kelautan Tropis with ISSN (Online) 2085-6695 starting from 2009-2017, then it changes in 2018 with name Jurnal Ilmu dan Teknologi Kelautan Tropis with ISSN (Online) 2620-309X until now. 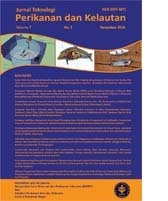 This journal is a scientific journal in the field of tropical marine science and technology and is published periodically three times a year by the Department of Marine Science and Technology of the Faculty of Fisheries and Marine Science-Bogor Agricultural University, Indonesian Association of Oceanologists, and the Association of Indonesian Coastal Management Experts. This journal is nationally accredited by Directorate General of Research and Development Strengthening (DGRDS), Ministry of Research, Technology and Higher Education of the Republic of Indonesia No. : 21/E/KPT/2018, dated 9 July 2018. JITKT has been also indexed/registered in DOAJ, Dimensions, Clarivate Analytics products (Emerging Sources Citation Index), Crossref, Science and Technology Index (SINTA), Google Scholar, Google Metrics, Cite Factor, ISJD, World Cat, Neliti, DRJI, BASE, Index copernicus, ESJI, and Cosmos. Editor's Address: Department of Marine Science and Technology, FPIK Jl. Lingkar Akademik, Darmaga Campus of IPB, Bogor 16680; Tel / Fax:(0251) 862-7323. Jurnal Pengolahan Hasil Perikanan Indonesia (JPHPI), formerly known as Buletin Teknologi Hasil Perikanan, was established in 1996 at the Department of Aquatic Product Technology. Since 2010, the publication of JPHPI has been jointly managed by the Department of Aquatic Product Technology and Masyarakat Pengolahan Hasil Perikanan Indonesian (MPHPI). Jurnal Fitopatologi Indonesia (JFI) is an official publication owned by the Indonesian Phytopathology Society (Perhimpunan Fitopatologi Indonesia). In 2010, JFI management was given to PFI Komda Bogor. Since then, JFI has been published 6 times (January, March, May, July, September, and November). JFI is an open-access, peer reviewed journal that has been Accredited by Directorate General of Higher Education (DGHE), Republic of Indonesia No. 12/M/Kp/II/2015 which is valid for 5 (five) years since enacted on 11 February 2015. JFI includes manuscript articles relating to plant diseases and their control, including pathogenic characterization, pathogen detection and identification, physiology and biochemistry of diseases, molecular biology, morphology and ultrastructure, genetics, disease transmission, ecology and epidemiology, chemical and biological control, Topics about abiotic abnormalities in plant health. Articles can be either original research papers, short communications, or disease note. Journal of Management & Agribusiness (JMA) publishes articles in agribusiness management fields such as agribusiness competitiveness, value chain of agribusiness, supply chain of agribusiness, and strategic agribusiness issues. JMA is published by School of Business, Bogor Agricultural University (SB-IPB) associated with Indonesian Society of Agricultural Economics (PERHEPI/ISAE). JMA was first published at the beginning of 2004 with twice per year in frequency on march and october. Since 2012, JMA has been published three times per year on March, July and November. Editor receives articles of empirical research and reviews in agribusiness management. JMA is a peer reviewed journal that has been Accredited by Directorate General of Higher Education (DGHE), Republic of Indonesia No 12/M/Kp/IE/2015 which is valid for 5 (five) years since enacted on 11 May 2015. Base on Directorate General of Higher Education (DGHE), Republic of Indonesia No 30/E/KPT/2018 JMA get ranked 2 accredited (SINTA 2) status. JMA has been registered in Crossref (since 2015), ACI - ASEAN Citation Index, DOAJ, Indonesian Publication Index (IPI), SINTA Rank 2, Google Scholar, and other scientific databases. Editors can revise the paper without changing the substance and content after a blind review process. The articles sent by the author must be an original script and is not being considered for publication by other journal or publishers. Jurnal Ilmu Pertanian Indonesia (JIPI) or Indonesian Journal of Agricultural Sciences is accredited by KEMENRISTEK DIKTI Nomor 51/E/KPT/2017, 4th Dec 2017. The journal publishes four times a year in Januari, April, July, and October. The publisher is Institut for Research and Community Services (LPPM), Bogor Agricultural University (IPB), Indonesia. Articles of the journal cover research results and policy analysis that are applicable in agricultural practices and sciences such as agronomy, soil sciences, pest and disease of zoological and medicinal veterinary, agricultural engineering, industrial technology, food technology, the science of nutrition, family and consumers, biometry, biology, climatology, livestock, fisheries and marine science, health care and the environment, forestry, and socioeconomic agriculture. Information on equipment, observation, and techniques the experiment will be accepted as articles notes. Indonesian Journal of Business and Entrepreneurship (IJBE) publishes information of empirical research and reviews in business and entrepreneurship. IJBE is published by School of Business, Bogor Agricultural University (SB-IPB) associated with Indonesian Alliance of Magister Management Program (APMMI). IJBE was first published at the beginning of 2015 with three issue per year in January, May, and September. Editor receives articles of empirical research and reviews in business and entrepreneurship. IJBE is a peer reviewed journal that has been Accredited by the Ministry of Research, Technology and Higher Education Number 32a/E/KPT/2017 which is valid for 5 (five) years since enacted on 26 April 2017.Base on Directorate General of Higher Education (DGHE), Republic of Indonesia No 30/E/KPT/2018 IJBE get ranked 2 accredited (SINTA 2) status. IJBE has been registered in Crossref, DOAJ, SINTA Rank 2, Indonesian Publication Index (IPI), Google Scholar, and other scientific databases. Jurnal Gizi dan Pangan -in english translate to Journal of Nutrition and Food- is the official publication of The Food and Nutrition Society of Indonesia in collaboration with the Department of Community Nutrition, Faculty of Human Ecology (FEMA), Bogor Agricultural University. This journal focuses its’ main research in the fields of nutrition and food. Scientific peer-reviewed articles are published routine, three times per year on March, July and November. According to the Ministry of Research, Technology and Higher Education Decree Number 12/M/Kp/II/2015, the Journal of Nutrition and Food is ACCREDITED since February 11th 2015 (including the issue number submitted in the accreditation process starting from Volume 7, Number 2, July 2012). The Jurnal Gizi dan Pangan has been indexed in Clarivate Analytics products (Emerging Sources Citation Index), DOAJ, Science and Technology Index (SINTA), Indonesian Publication Index (IPI), Google Scholar, and other scientific databases. The Journal also used Similarity Check to prevent any suspected plagiarism in the manuscripts. The Jurnal Gizi dan Pangan has a competent Board of Editors in the fields of nutritional and food sciences. The board consists of a variety of institutions related in food and nutrition. This Journal is managed with high commitment despite the number of challenges that are faced. The Editorial team welcomes lecturers, researchers and other scientists to publish their scientific articles here in Journal of Nutrition and Food. Buletin Agrohorti merupakan jurnal nasional tidak terakreditasi. Terbit setahun tiga kali pada bulan Januari, Mei, dan September berisi 15 artikel. Mulai tahun 2018 (Volume 6), terbitan artikel ditambah menjadi 16 artikel per edisi. Buletin Agrohorti dicetak terbatas dan dapat diperoleh dengan menghubungi editor pelaksana melalui email: buletinagrohorti@apps.ipb.ac.id dengan mengganti biaya cetak sebesar Rp. 150.000 termasuk ongkos kirim. The Agrohorti Bulletin is a non-accredited national journal. Publish three times a year in January, May and September and containing 15 articles. Starting in 2018 (Volume 6), the article published was added to 16 articles per edition. The Agrohorti Bulletin is limited and can be obtained by contacting the executive editor via email: buletinagrohorti@apps.ipb.ac.id by replacing the printing costs of Rp. 150,000 including shipping costs. Artikel yang dipublikasikan pada Buletin Ilmu Makanan Ternak mencakup cakupan luas topik penelitian dalam bidang ilmu nutrisi dan teknologi pakan, termasuk agrostologi, industri dan teknologi pakan, nutrisi ternak unggas, nutrisi ternak pedaging, nutrisi ternak kerja dan olahraga, nutrisi ternak perah, nutrisi satwa harapan dan hewan peliharaan, mikrobiologi rumen, mikrobiologi ternak, fisiologi nutrisi, metabolisme nutrisi, kajian biologi molekuler terkait nutrisi pakan, ternak dan metabolismenya, dan kajian-kajian lain yang relevan dengan topik dan isu terkini dalam bidang ilmu nutrisi dan teknologi pakan. Jurnal Ilmu Nutrisi dan Teknologi Pakan diterbitkan sejak 1987, dengan nama Bulletin Makanan Ternak (Bulmater) dapat diakses di http://journal.ipb.ac.id/index.php/bulmater/ index. Mulai tahun 2018, dilakukan perubahan nama untuk menyesuaikan dengan kondisi terkini dan frekuensi penerbitan menjadi 3 kali dalam setahun (April, Agustus dan Desember). Artikel yang dipublikasikan pada Jurnal Ilmu Nutrisi dan Teknologi Pakan mencakup cakupan luas topik penelitian dalam bidang ilmu nutrisi dan teknologi pakan, termasuk agrostologi, industri dan teknologi pakan, nutrisi ternak unggas, nutrisi ternak pedaging, nutrisi ternak kerja dan olahraga, nutrisi ternak perah, nutrisi satwa harapan dan hewan peliharaan, mikrobiologi rumen, mikrobiologi ternak, fisiologi nutrisi, metabolisme nutrisi, kajian biologi molekuler terkait nutrisi pakan, ternak dan metabolismenya, dan kajian-kajian lain yang relevan dengan topik dan isu terkini dalam bidang ilmu nutrisi dan teknologi pakan. Naskah yang akan diterbitkan adalah naskah yang dinilai oleh reviewer dan disetujui oleh Dewan Redaksi. Jurnal Ilmu Produksi dan Teknologi Hasil Peternakan adalah Jurnal yang diterbitkan tiga kali dalam satu tahun. Jurnal IPTHP menerima dan mempublikasikan jurnal dengan topik produksi, manajemen, dan lingkungan ternak, genetika dan pemuliaan ternak, teknologi hasil ternak, serta sosial ekonomi peternakan. Journal of Mathematics and Its Applications merupakan media yang memuat informasi hasil penelitian matematika baik mumi maupun terapan, bagi para matematikawan atau para pengguna matematika. JMA diterbitkan dua kali (dua nomor) setiap tahun (periode Juli dan Desember). Jurnal Manajemen Pembangunan Daerah (Jurnal MPD) adalah jurnal ilmiah berkala bidang Manajemen Pembangunan Daerah meliputi rumpun kelilmuan Ekonomi, Manajemen, Keuangan, dan Sosial Pembangunan. Jurnal MPD memiliki bertujuan sebagai media penyebarkan infomasi yang bersifat kenikian dalam kerangka Pembangunan Daerah di Indonesia. Jurnal MPD memuat berbagai hasil riset (teori dan aplikatif) sebagai refersensi dalam pengambilan kebijakan dan program bagi Apartur Pemerintahan (pemda, kementrian dan lembaga), praktisi, politisi dan pegiat pembangunan daerah. Jurnal MPD diterbitkan dua kali (Juni dan November) dalam setahun oleh Program Studi Manajemen Pembangunan Daerah, Fakultas Ekonomi dan Manajemen IPB bekerjasama dengan Perhimpunan Ilmu Ekonomi Pertanian Indonesia (PERHEPI). Jurnal Entomologi Indonesia (JEI) publishes original research papers and short communications that covers the basic and applied aspect of insects and mites or other arthropods in agriculture, forestry, human and animal health, and natural resources and environmental management. The journal is published by Perhimpunan Entomologi Indonesia (Entomological Society of Indonesia). JEI is an open-access, peer reviewed journal that has been Accredited by Directorate General of Higher Education (DGHE), Republic of Indonesia No. 48a/E/KPT/2017 on 30 October 2017. Majalah ilmiah ini merupakan sarana pemberitaan hasil-hasil penelitian dan penelaahan perkembangan ilmu pertanian dan ilmu-ilmu lain yang dapat dimanfaatkan dalam bidang pertanian. Naskah yang dapat diterima untuk dimuat dalam majalah ini adalah naskah yang belum pernah diterbitkan pada terbitan lain dan mendapat persetujuan dari Dewan Editor. Habitus Aquatica is the peer reviewed publication of basic and applied research articles in a broad range of subject areas relevant to aquatic and fisheries science. The journal publishes articles, short communications, and reviews that contribute to a scientific understanding in the areas of Aquatic Science including and related to structure and dynamics of aquatic ecosystems, impacts and adaptations to pollution and global changes, socio-economical analysis of environmental benefits, impacts and bioconservation, ecosystems restoration and ecological engineering; and Fisheries Science including fisheries biology, aquaculture, environment, chemistry and biochemistry. Jamu (empirical based herbal medicine) yang merupakan ciri khas dan warisan berharga dari turun temurun nenek moyang bangsa Indonesia ini biasanya belum melalui proses uji kelayakan. Pada mulanya masyarakt tradisional dihadapkan dengan sakit dan berbagai penyakit yang kemudian berdasarkan pengalaman mereka menemukan obat yang berasal dari tanaman sekitar yang dapat menyembuhkan penyakit. Masyarakat pada umumnya menyebut tanaman tersebut adalah jamu. Namun tanaman tersebut sebagian besar belum dapat dibuktikan sebagai fungsi obat secara uji klinis, sehingga belum dapat diketahui apakah memiliki kontaradiksi pada saat penggunaannya, memiliki efek racun, dan takaran dosis optimum sehingga dapat berfungsi sebagai obat yang manjur. Hal ini menjadi perhatian penting bagi para ilmuan untuk lebih menggali keanekaragaman hayati yang dapat mengeksplor informasi tentang tanaman jamu sebagai obat herbal yang berfungsi utama untuk kesehatan. Oleh karena itu Pusat Studi Biofarmaka sebagai salah satu Lembaga Penelitian dan Pengembangan yang memiliki visi menjadi Pusat Unggulan Riset dan Inovasi Teknologi Bidang Biofarmaka di Tingkat Nasional dan Internasional mengambil peran penting untuk terus berupaya meningkatkan citra dan peran produk obat herbal jamu Indonesia melalui penelitian-penelitian yang terintegrasi dari hulu ke hilir. Untuk mencapai visi yang telah ditetapkan tersebut PSB memiliki salah satu misi yaitu mengembangkan ilmu, teknologi dan seni yang berorientasi ke depan yang berbasis penelitian sehingga mampu menghasilkan luaran IPTEK, potensi, dan prodak biofarmaka yang memenuhi syarat pendidikan, publikasi, paten dan berorientasi HaKI yang mendukung kemandirian bangsa. Dalam rangka mencapai visi dan misi tersebut PSB melakukan salah satu upaya peningkatan pendayagunaan inovasi IPTEK biofarmaka melalui kegiatan diseminasi hasil-hasil riset dan teknologi kepada masyarakat luas dengan akan dibentuknya suatu jurnal ilmiah yang bernama JURNAL JAMU INDONESIA. Jurnal Jamu Indonesia ini didedikasikan untuk pertukaran informasi dan pemahaman keilmuan yang meluas mengenai dunia jamu melalui publikasi-publikasi ilmiah nasional/internasional (makalah ilmiah , paten), konferensi/seminar, dan rumusan kebijakan. Jurnal CARE (Jurnal Resolusi Konflik, CSR, dan Pemberdayaan) merupakan jurnal yang berisi artikel-artikel yang meliputi hasil-hasil penelitian, analisis kebijakan, dan opini tentang resolusi konflik dan CSR, serta hasil-hasil pengabdian/pemberdayaan kepada masyarakat yang berhubungan dengan biosains, kelautan, dan pertanian tropika dalam arti luas; mencakup biologi, klimatologi, agronomi, ilmu tanah, arsitektur lanskap, proteksi tanaman, kedokteran hewan, gizi dan kesehatan masyarakat, keluarga dan konsumen, teknologi industri, teknologi pangan, keteknikan pertanian, peternakan, perikanan, kehutanan, konservasi, lingkungan, sosial-ekonomi, dan kewirausahaan. Terbit pada Juni 2017, 2 kali dalam 1 tahun. Journal of Family Science (JFS) is a scientific journal providing researched paper on the subject of family ecology, family development, family interaction, and any topics related family studies published two times a year by the Department of Family and Consumer Sciences, Faculty of Human Ecology, Bogor Agricultural University. Jurnal Pengelolaan Perikanan Tropis (JPPT) merupakan jurnal ilmiah yang terbit secara elektronik dan cetak yang berkaitan dengan hasil penelitian, dan usulan ilmiah tentang biodiversitas ikan, biologi perikanan, kajian stok ikan, kebijakan perikanan, pengelolaan perikanan berbasis ekosistem, teknologi penangkapan, pemanfaatan hasil perikanan, perdagangan ikan, perencanaan wilayah pengelolaan perikanan, dan kearifan lokal dalam pengelolaan perikanan tropis untuk mewujudkan sumberdaya perikanan yang berkelanjutan. Jurnal Keteknikan Pertanian (JTEP) or Journal of Agricultural Engineering, previously named Agricultural Engineering Bulletin, is an official publication of the Indonesian Society of Agricultural Engineers (ISAE) in collaboration with the Department of Mechanical and Biosystem Engineering, Faculty of Agricultural Technology and Engineering, Bogor Agricultural University. JTEP is published three times a year in April, August and December. JTEP is a peer reviewed journal that has been accredited by the Ministry of Research, Technology and Higher Education Number I/E/KPT/2015 which is valid for 5 (five) years since enacted on 21 September 2015. JTEP has been registered in Crossref, DOAJ, Indonesian Publication Index (IPI), Google Scholar, and other scientific databases. JTEP receives manuscripts of research results or scientific review in agricultural engineering related to land and water resources engineering, agricultural machinary, farm structures and environment, alternative energy and electrification, ergonomics and electronics, food and agricultural product processing engineering, and management and information systems. The articles sent by the author - must be an original script and is not being considered for publication by other journal or publishers - should be written in accordance with the writing guidelines and submitted online via http://journal.ipb.ac.id/index.php/jtep. Editors can revise the paper without changing the substance and content after a blind review process. Agroindustry is strategical industry in Indonesia considering to the comparative superiority of its tropical climate; great islands and maritime. The comparative advantages can be able to grow as the competitive advantage through agroindustrial development which have higher quality and added-value. Jurnal Teknologi Industri Pertanian (Journal of Agroindustrial Technology) is an open acces a peer reviewed journal published by Indonesian Association of Agroindustry in cooperation with Department of Agroindustrial Technology, Faculty of Agricultural Technology, Bogor Agricultural University to facilitate researchers, observers, authors, and practitioners in the field of agroindustries covering process technology, industrial system engineering, and environmental management. Journal of Agroindustrial Technology has been accredited by Ministry of Research, Technology and Higher Education of Indonesia. The published articles in Journal of Agroindustrial Technology have been selected and reviewed by competent Editors Board and Peer-Reviewers. Only the articles consist of novelty in agroindustrial technology fields and excellent scientific contribution can be published in Journal of Agroindustrial Technology. Albacore merupakan jurnal ilmiah penelitian perikanan laut dan transportasi maritim dengan jadwal penerbitan tiga kali dalam satu tahun. Jurnal ini menyebarkan informasi ilmiah kepada peneliti, akademisi, praktisi dan pemerhati mengenai pemanfaatan sumberdaya perikanan di Indonesia yang meliputi berbagai aspek seperti teknologi eksploitasi dan eksplorasi, perkapalan dan navigasi, pelabuhan perikanan, keselamatan kerja, tingkah laku ikan, peraturan dan perundangan serta kebijakan, pengelolaan sumberdaya perikanan secara umum, dan transportasi maritim. Naskah yang dimuat dalam jurnal ini berasal dari penelitian atau ulasan akademisi dari berbagai universitas, lembaga pemerintah dan pemerhati permasalahan pengelolaan sumberdaya perikanan tangkap dan transportasi maritim di Indonesia. Jurnal Akuakultur Indonesia (JAI) is a scientific journal publishes empirical research and recent science development in aquaculture. JAI is published twice a year in January and July since 2002 by the Indonesian Society of Scientific Aquaculture (ISSA) in association with the Department of Aquaculture, Faculty of Fisheries and Marine Science, Bogor Agricultural University. JAI accepts manuscripts written in English and in Bahasa (Indonesian). JAI only processes submitted original script related to aquaculture and not being published by other publishers. JAI has been registered in some indexing tools like Directory of Open Access Journals (DOAJ), Indonesian BASE, Publication Index (IPI), Google Scholar, Portal Garuda, Mendeley, SINTA, and IPB repository. Jurnal Hortikultura Indonesia, JHI (Indonesian Journal of Horticulture), is an official publication of the Indonesian Society for Horticulture, founded in 2010, first launched and published in National Seminar of Indonesian Horticulture, Udayana University – Bali at 25thNovember 2010. The JHI publishes primary research paper, review article, policy analysis and research notes and preliminary results in all areas of horticulture. Manuscripts could be written either in English or in Indonesia. JHI is a triannual publication; April, August, December. The JHI is published Indonesian Society for Horticulture (PERHORTI) in partnership with Department of Agronomy and Horticulture, Faculty of Agriculture, Bogor Agricultural University (IPB). Jurnal Hortikultura Indonesia (Indonesian Journal of Hortikultura) was accredited “B” as a national journal as well as SINTA 2 category, based on Decree of Directorate General for Higher Education No 2/E/KPT/2015, dated 1stDecember 2015 on Accreditation of Scientific Journals by Directorate General for Higher Education in the first period on 2015. Journal of Business and Management Application (JABM) published articles in the field of business and management applications such as business strategy management, financial management, human resources and organization, business value chain and other issues in the field of business and management. This scientific journal is published by School of Business, Bogor Agricultural University (SB-IPB) associated with Indonesian Alliance of Magister Management Program (APMMI). JABM began the publication in August 2015 with a frequency of three times a year. Starting in 2016, JABM will be published in January, May and September. JABM is a peer reviewed journal that has been Accredited by Directorate General of Higher Education (DGHE), Republic of Indonesia No 51/E/KPT/2017 which is valid for 5 (five) years since enacted on 4 December 2017. Base on Directorate General of Higher Education (DGHE), Republic of Indonesia No 30/E/KPT/2018 JABM get ranked 2 accredited (SINTA 2) status. JABM has been registered in Crossref, DOAJ, Indonesian Publication Index (IPI), Google Scholar, and other scientific databases. Editors receive written results of scientific research, both in the form of empirical research in fields related to business and management applications. Editors can revise the paper without changing the substance and content after a blind review process. The articles sent by the author must be an original script and is not being considered for publication by other journal or publishers. Buletin PSP merupakan jurnal ilmiah dengan jadwal penerbitan 3 kali dalam satu tahun. Jurnal ini menyebarkan informasi ilmiah kepada para peneliti, akademisi, praktisi dan pemerhati mengenai pemanfaatan sumberdaya perikanan di Indonesia yang meliputi berbagai aspek seperti teknologi eksploitasi dan eksplorasi, perkapalan dan navigasi, pelabuhan perikanan, tingkah laku ikan, peraturan dan perundangan serta kebijakan dan pengelolaan sumberdaya perikanan secara umum. Naskah yang dimuat dalam buletin ini berasal dari penelitian atau ulasan staf pengajar/akademisi dari berbagai universitas di Indonesia, lembaga pemerintahan dan pemerhati permasalahan pengelolaan sumberdaya perikanan tangkap di Indonesia. e-JAII Series is a quad-annual national referred journal with the objectives to disseminate, explore, develop, and elucidate the knowledge of engineering design and technology in agro-industrial development issues, to keep practitioners and researchers informed on current issues and best practices, as well as serving as a platform for the exchange of ideas, knowledge, and expertise among academician, technology researchers and practitioners. e-JAII Series provides an opportunity to share detailed insights from different understandings and practices associated with technology. It provides cross-disciplinary exchange of insights and ideas regarding value and practices for dissemination. e-JAII Series will publish your work to national society of practitioners and researchers with interest in technology design and development from a wide variety of agro-industrial sectors. Jurnal Sumberdaya HAYATI merupakan jurnal ilmiah yang terbit secara on-line dan menerbitkan artikel atau karya ilmiah hasil penelitian dalam bidang biologi seperti keanekaragaman hayati, bioteknologi, dan isu-isu lingkungan. Keanekaragaman hayati mencakup semua topik kehidupan termasuk virus, mikroba, cendawan, tanaman, hewan, dan manusia. Current Biochemistry (CB) publishes the results of original research that contribute significantly to the understanding of the chemical compound and reaction that occur within living organism. Preference will be accorded to manuscripts that develop new concepts or experimantal approaches, particularly in the advancing areas of biochemistry science. Manuscripts that are primarily theoretical in nature or in the field of bioinformatics must be directed toward explaining important results previously not understood, making important predictions that can be experimentally tested, or developing segnificant advances in theory of general interest to biochemists. Submission of manuscripts in emerging areas in biochemistry, chemical biology, biophysics, proteomics, model studies and structures, cellular and molecular biology, computational biochemistry, biotechnology, and new methods development is encouraged especially if they address basic biochemical mechanisms. Manuscripts should be written and published in Bahasa or English and should be submitted to CB. Authors should refer to the guidline below when preparing their manuscripts. Previously published manuscripts (either in whole or in part) will not be considered. Department of Biochemistry. Xplore: Journal of Statistics diterbitkan berkala 3 (tiga) kali dalam setahun yang memuat tulisan ilmiah yang berhubungan dengan bidang statistika. Artikel yang dimuat berupa hasil penelitian atau kajian pustaka dalam bidang statistika dan atau penerapannya. This Journal, namely Journal of Indonesian Civil and Environmental Engineering (Jurnal Teknik Sipil dan Lingkungan Indonesia), in short, JSIL was established in 2016 and managed by the Department of Civil and Environmental Engineering, IPB University (Bogor Agricultural University). The journal aims at disseminating original and quality academic papers that deemed potential to contribute to the advancement of science and technology in the field of civil and environmental engineering to support sustainable developments. The journal covers any scopes within civil and environmental engineering, such as land and water resources, geomatics, infrastructures, structures and environments. The journal receives original papers from various contributors, such as academicians, scientists, researchers, practitioners and students from all over the world. Paper to be submitted can be written in Indonesian language or English with the abstract is in English only. The submitted paper will be reviewed by at least two independent reviewers. Author who will submit the paper is requested to download the available template and follow the instructions there. setiap tahunnya, yaitu periode Juli dan Desember. Acta VETERINARIA Indonesiana . Acta Vet Indones . 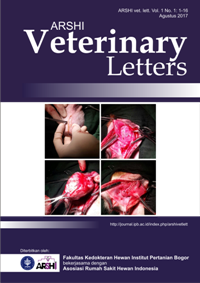 The Indonesian Veterinary Journal is an open access, peer-reviewed, online journal that publishes articles in the form of research, reviews, case studies, and short communications relating to various aspects of science in veterinary, biomedical, animal husbandry, biotechnology, and biodiversity of fauna. Articles are written in Indonesian or English. 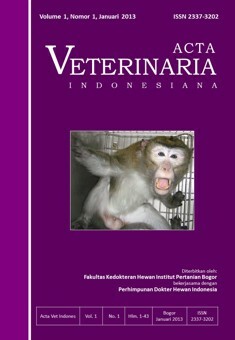 Acta VETERINARIA Indonesiana is published by the Faculty of Veterinary Medicine of the Bogor Agricultural University (FKH IPB) in collaboration with the Indonesia Veterinary Medical Association (PDHI). This journal is published since 2013, published 2 (two) times in 1 (one) year, i.e. in January and July. 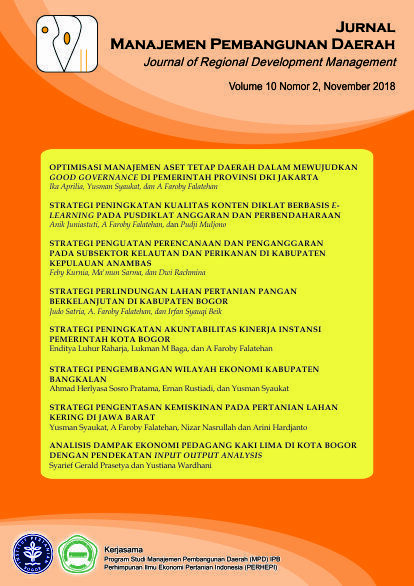 Jurnal Komunikasi Pembangunan (Jurnal KMP) is a journal that publishes research results on development communication, especially related to agriculture and rural areas. Jurnal KMP is published twice a year, in February and July. Agromet publishes original research articles or reviews that have not been published elsewhere. The scope of publication includes agricultural meteorology/climatology (the relationships between a wide range of agriculture and meteorology/climatology aspects). Articles related to meteorology/climatology and environment (pollution and atmospheric conditions) may be selectively accepted for publication. This journal is published twice a year by Indonesian Association of Agricultural Meteorology (PERHIMPI) in collaboration with Department of Geophysics and Meteorology, Faculty of Mathematics and Natural Sciences, Bogor Agricultural University. Agromet berisi naskah asli hasil penelitian atau telaahan (review) yang belum pernah dipublikasikan. Lingkup isi tulisan meliputi bidang meteorologi/klimatologi pertanian (kaitan antara pertanian dalam arti luas dengan aspek meteorologi atau klimatologi). Artikel yang berkaitan dengan meteorologi/klimatologi dan lingkungan (polusi dan kondisi atmosfer) dapat diterima secara selektif. Jurnal ini diterbitkan 2 (dua) kali dalam setahun oleh Perhimpunan Meteorologi Pertanian Indonesia (PERHIMPI) bekerjasama dengan Departemen Geofisika dan Meteorologi, Fakultas Matematika dan Ilmu Pengetahuan Alam, Institut Pertanian Bogor. Saat masalah yang terkait dengan mutu dan keamanan produk pangan yang dijual dihadapi atau terdapat produk pangan kompetitor diluncurkan di pasaran atau ketika produk pangan sejenis dikembangkan, maka Departemen Penelitian dan Pengembangan (R&D) di industri pangan menjadi divisi yang paling sibuk mencari solusinya. Departemen R&D berperan penting dalam menghasilkan produk pangan baru agar bisnis terus berkembang, sehingga Departemen ini sering disebut sebagai jantungnya perusahaan. Agar Departemen R&D dapat berperan secara optimal, maka literatur yang mendukung kegiatan R&D sangat dibutuhkan. Jurnal dan publikasi ilmiah hasil penelitian dapat menjadi salah satu sumber pembangkit ide dan sebagai referensi untuk mendapatkan solusi dari suatu permasalahan di industri pangan. Untuk memenuhi kebutuhan terhadap literatur terutama bagi praktisi di industri pangan, Gabungan Perusahaan Makanan dan Minuman Indonesia (GAPMMI) bekerjasama dengan Departemen Ilmu Dan Teknologi Pangan (ITP), Fakultas Teknologi Pertanian, Institut Pertanian Bogor (IPB) menerbitkan Jurnal Mutu Pangan (Indonesian Journal of Food Quality). Oleh karena itu, jurnal ini merupakan publikasi ilmiah resmi dari GAPMMI dan Departemen ITP-IPB. Sesuai dengan sasaran Jurnal Mutu Pangan, ruang lingkup naskah sebagai hasil penelitian dan komunikasi singkat terkait dengan kebutuhan para praktisi di industri pangan, baik naskah tentang pengembangan metode dan produk, teknologi proses pengolahan pangan, kajian kebijakan atau regulasi pangan, analisis risiko, rancangan sistem mutu dan keamanan pangan, rancangan bisnis atau studi kelayakan, serta mutu, gizi dan kesehatan. Pada setiap naskah disajikan Aplikasi Praktis yang memuat secara ringkas manfaat hasil penelitian dan potensinya untuk diaplikasikan di industri pangan. Pada Volume 1(1) April 2014 sebagai edisi perdana disajikan naskah hasil penelitian Kebijakan-Regulasi Pangan, Gizi dan Kesehatan, Mutu Pangan, dan Teknologi Proses. Selamat Membaca! Jurnal Manajemen dan Organisasi merupakan media publikasi ilmiah yang memuat artiket-artikel; di bidang manajemen dan organisasi dengan ruang lingkup manajemen pemasaran, keuangan, sumber daya manusia dan operasi. Jurnal Manajemen dan Organisasi didedikasikan untuk menumbuhkan kreasi pertukaran ide antara akademisi, kalangan industri atau bisnis praktis, dan institusi pemerintah dalam bidang manajemen dan organisasi. Jurnal ini diterbitkan tiga kali dalam setahun, yaitu bulan April, Agustus, dan Desember. Artikel yang dimuat dalam jurnal ini mengedepankan analisis objektif terhadap kasus manajemen dan organisasi dalam perspektif akademik berupa hasil penelitian di bidang manajemen dan organisasi dalam perpektif akademik berupa hasil penelitian di bidang manajemen dan review terhadap konsep manajemen baru maupun implementasi konsep manajemen dengan studi literatur. Redaksi menerima naskah dari berbagai pihak untuk dimuat pada jurnal ini. Naskah yang masuk harus mengikuti Format Penulisan Naskah Jurnal Manajemen dan organisasi. Jurnal Penyuluhan is published to communicate research results on improving human resources capacity in various fields in micro, messo as well as macro scopes. The researchers, bussiness actors, policy maker, academicians, extension workers, and those interested in developing sciences and practical aspects in human behaviour transformation. Authors can send their articles to editor for further review by Mitra Bestari. Jurnal Penyuluhan has been acredited based on SK Dirjen Penguatan Riset dan Pengembangan Kementerian Riset, Teknologi dan Pendidikan Tinggi No. 36a/E/KPT/2016 dated on May 23, 2016. Natural Resources and Environmental Management Studies Program, Graduate School of Bogor Agricultural University (PS-PSL, SPs IPB) in collaboration with Center for Environmental Research - Institute for Research and Community Service, Bogor Agricultural University (PPLH-LPPM, IPB) has been managing JPSL since 2011, with a period of two numbers per year. Since 2017, JPSL has published three numbers per year. The Journal of Natural Resources and Environment Management (JPSL) is a scientific periodical that presents scientific articles, conceptual thoughts, reviews, and book reviews on natural and environmental resource management that have tropical characteristics. Each manuscript submitted to the Journal of Natural Resources and Environmental Management is reviewed by a reviewers. JPSL has been indexed in: DOAJ (Directory of Open Access Journal), Google Scholar, Indonesian Publication Index (IPI), and CrossRef. JPSL has also been accredited by Kemenristekdikti with Decree No. 60/E/KPT/2016. Valid from November 18, 2016 to November 18, 2021. Al-Muzara'ah –Journal of Islamic Economics and Finance, is a collaborative journal of the Department of Islamic Economics, IPB University with the Indonesian Association of Islamic Economist (IAEI). The aim of the journal is to communicate and as the media of academic socialization by providing a platform for publication of research in the fields of Islamic economics, finance, microfinance, banking, insurance, halal industry, social finance and poverty alleviation, law and sharia issues in economics and finance, capital market, and other topics related to this area. Al-Muzara'ah has been Accredited SINTA Rank 3 by Directorate General of Research and Development Strengthening, Ministry of Research, Technology and Higher Education of the Republic of Indonesia (Kemenristekdikti RI) No 34/E/KPT/2018 which is valid for 5 (five) years since enacted on 10 December 2018. Al-Muzara'ah has been registered in Crossref, Google Scholar, Indonesian Publication Index (IPI), Garda Rujukan Digital (Garuda), Indonesia One Search (IOS), and Neliti. Welcome to Jurnal Lanskap Indonesia (JLI). We are a leading Landscape Architectural Journal in Indonesia. The JLI is a periodical scientific peer reviewed publication hosted by Department of Landscape Architecture, Faculty of Agriculture, Bogor Agricultural University collaborate with the Indonesian Society of Landscape Architects (IALI). The journal's aimed to enhance conceptual, scientific understanding and application in developing sustainable landscapes as a solution to landscape change. Various scientific disciplines and perspectives are needed to understand the landscape and harmonize the social and ecological values to ensure landscape sustainability. The articles with themes in Landscape Planning, Design, Management, and Landscape Plants; Planning and Development of urban and rural areas; Ecology and environment; Landscape ecological engineering; The history and culture of the landscape are welcome to submit to this journal. Media Konservasi is a scientific journal of Natural Resousrces Conservation and Environment. Media Konservasi is the first media in Indonesia who discuss issues about conservation. Media Konservasi published three times a year on April, August and December. Media Konservasi commited to publish a good quality articles in the form of a scientific paper based on results study, library research, review articles and surgical outcome book has never been published in another journal. This journal covering all aspect of wildlife ecology and management; ecotourism; protected area management; conservation of plant diversity; urban forest and environtmental services. Media Konservasi is indexed in Sinta (Sinta score = S3). Jurnal Risalah Kebijakan Pertanian dan Lingkungan: Rumusan Kajian Strategis Bidang Pertanian dan Lingkungan. Hasil-hasil penelitian di IPB baik berupa paten, artikel ilmiah, sinopsis, teknologi tepat guna, atau buku perlu disebarluaskan kepada pengambil kebijakan, maupun masyarakat pengguna, termasuk industri yang langsung dapat memanfaatkannya. Direktorat Kajian Strategis dan Kebijakan Pertanian IPB memandang bahwa, mengantarmukakan science dan kebijakan merupakan tahapan yang sangat penting untuk mewujudkan pembangunan yang berkelanjutan. Memperhatikan hal tersebut, maka peningkatan peran IPB dalam pengambilan kebijakan pertanian merupakan hal yang perlu dilakukan. Jurnal yang dikelola oleh Departemen Hasil Hutan, menyajikan Ilmu, Teknologi, dan Keteknikan (kayu, komposit kayu, pulp dan kertas, serta hasil hutan non kayu, juga konsen terhadap isu-isu lingkungan dan kebijakan-kebijakan terkait hasil-hasil hutan). Jurnal Agribisnis dan Ekonomi Pertanian (Agribusiness and Agricultural Economic Journal/ AAE Journal) adalah jurnal ilmiah berkala bidang agribisnis dan ekonomi pertanian di Indonesia. Jurnal ini merupakan media penyebarluasan informasi hasil pemikiran dan penelitian dari dosen, peneliti, dan praktisi yang berminat untuk kemajuan agribisnis dan ekonomi pertanian. Lingkup artikel dalam jurnal ini memfokuskan pada kajian agribisnis dari pendekatan makro meliputi aspek sosial ekonomi pertanian sebagai suatu sistem yang komprehensif dan terintegrasi mulai dari kajian subsistem up-stream, subsistem on-farm, subsistem down stream, dan subsistem penunjang serta dampak interelasinya dengan kebijakan pemerintah, perekonomian internasional dan kapitalisasi sumberdaya lahan, petani, dan masyarakat. Adapun dari pendekatan mikro meliputi kajian persoalan-persoalan dalam pengembangan usaha di bidang agribisnis (finansial, kebijakan usaha, dan aspek teknis fungsional). Manajemen IKM merupakan Jurnal Pengembangan Manajemen Industri Kecil Menengah (IKM) yang diterbitkan oleh Program Studi Magister Pengembangan Industri Kecil Menengah (MPI) Sekolah Pascasarjana IPB sejak September 2006, memuat kegiatan dunia usaha kecil menengah (UKM), khususnya IKM beserta instansi yang terkait seperti perbankan, departemen teknis dan usaha swasta besar dan petani/nelayan. Manajemen IKM terbit setiap 6 bulan sekali (Februari dan September) dan ditujukan sebagai wadah untuk mengkomunikasikan hasil-hasil penelitian dari kajian tugas akhir mahasiswa MPI, khususnya yang terkait dengan pembinaan dan pengembangan IKM. Namun demikian, tulisan yang diterima Manajemen IKM terbuka bagi berbagai kalangan yang memiliki ketertarikan dalam pembinaan dan pengembangan IKM, baik itu peneliti, penyuluh, maupun pengusaha. Dengan diterbitkannya jurnal ini, maka kedepannya diharapkan lebih dipahami potensi, kendala dan pengembangan IKM melalui pendekatan holistik dan sinergi yang dilihat dari faktor-faktor ekonomi, manajerial dan faktor-faktor lainnya seperti kemitraan. Perintisan jurnal sebagai berkala ilmiah berwawasan nasional dimulai sejak Februari 2006 dengan nama Jurnal MPI dengan No. ISSN 1907-3127 yang memuat 9 judul artikel pada setiap edisi. Mulai terbitan edisi September 2009, judulnya dirubah menjadi Jurnal Manajemen IKM dengan No. ISSN 2085-8418. Jurnal Manajemen IKM selama ini mampu menjadi sarana penyebarluasan informasi ilmiah kepada para dosen atau peneliti lainnya, maupun masyarakat pengguna, serta sarana pengembangan. 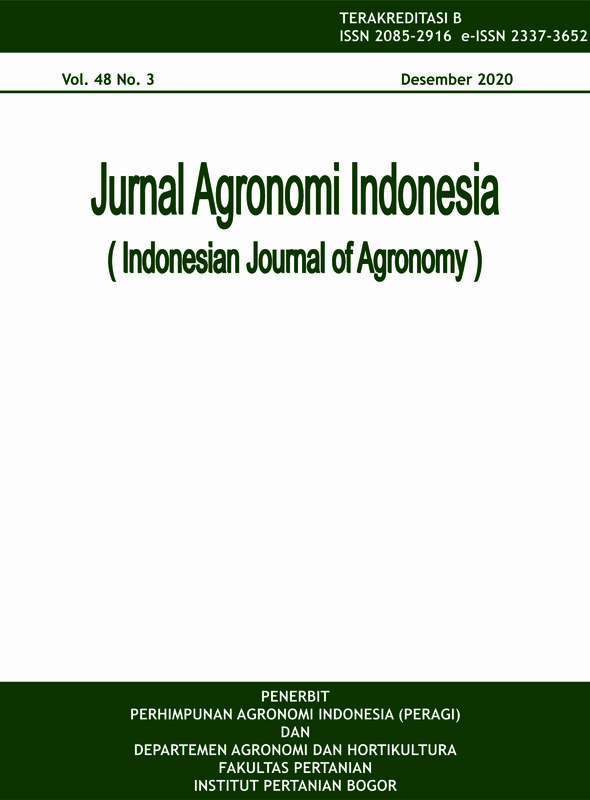 Journal of Indonesian Agribusiness is a periodical scientific journals of agribusiness in Indonesia. This journal is media of information dissemination which is the thinking results and research of lecturers, researchers and practitioners who are interested in agribusiness development. This journal is expected to help the agribusiness practitioners, policy makers, lecturer, students, and other people to get better understanding of the situation and condition of Indonesian agribusiness. Especially, benefit for the Indonesian agribusiness development and generally for improving the welfare of the Indonesian people. This journal is published twice a year (June and December Edition) by the Department of Agribusiness, Faculty of Economics and Management, Institut Pertanian Bogor. Jurnal Ilmu Keluarga & Konsumen (JIKK) is a scientific journal that publishes research results that can contribute to improving the quality of life for families and consumers. The topics of the research that is published in JIKK such as: family well-being, family resilience, family sociology, family psychology, family resource management, family education, family ecology, family communications, family development, gender relations within the family, human growth and development, child care and protection, parenting; consumer behavior, consumer education, and consumer protection. JIKK was first published by Department of Family and Consumer Sciences, Faculty of Human Ecology, Bogor Agricultural University (IPB) since 2008 and published twice a year in January and August. Since 2013, JIKK published three times a year in January, May, and September. In addition, since 2014, JIKK is jointly published by Department of Family and Consumer Sciences, Faculty of Human Ecology, Bogor Agricultural University (IPB) and Association of Indonesian Family and Consumer Sciences (ASIKKI). Based on the decree of Directorate General of Research and Development Strengthening, Ministry of Research, Technology, and Higher Education of Republic Indonesia No 2/E/KPT/2015, JIKK has been accredited since December 1, 2015. Base on Directorate General of Higher Education (DGHE), Republic of Indonesia No 30/E/KPT/2018 JIKK get ranked 2 accredited (SINTA 2) status. Forum Statistika dan Komputasi (ISSN:0853-8115) was published scientific papers in the area of statistical science and the applications. It is issued twice in a year. The papers should be research papers with, but not limited to, following topics: experimental design and analysis, survey methods and analysis, operation research, data mining, statistical modeling, computational statistics, time series and econometrics, and statistics education. Started from October 2017 edition the name of Forum Statistika dan Komputasi was changed to Indonesian Journal of Statistics and Its Applications and the website was moved to the new website (http://journal.stats.id). Therefore, Authors who will submit new manuscripts should register in the new website. Meanwhile, the previous editions (up to 2017 edition) will still use Forum Statistika dan Komputasi as the title and could be accessed in the old website (http://journal.ipb.ac.id/index.php/statistika). Jurnal Primatologi Indonesia (JPI) merupakan jurnal ilmiah primatologi yang diterbitkan oleh Pusat Studi Satwa Primata, Lembaga Penelitian dan Pengabdian kepada Masyarakat Institut Pertanian Bogor (PSSP LPPM-IPB) bekerjasama dengan Perhimpunan Ahli dan Pemerhati Primata Indonesia (PERHAPI). Tujuan dan ruang lingkup penelaahan: 1) satwa primata sebagai model dalam pencegahan dan penyembuhan penyakit manusia, 2) patologi, imunologi, parasitologi, mikrobiologi dan kedokteran hewan primata, 3) morfologi, fisiologi, reproduksi, taksonomi, pertumbuhan dan perkembangan, evolusi dan sistematika serta genetika satwa primata, 4) penangkaran, penanganan, metodologi eksperimen serta manajemen koloni dan laboratorium satwa primata, 5) ekologi, demografi, pelestarian dan manajemen kawasan konservasi satwa primata, 6) neurologi, tingkah laku, sosiologi, komunikasi, psikologi dan kesejahteraan satwa primata, dan 7) kebijakan pemanfaatan, pelestarian dan pengembangan satwa primata. Terbit dua kali setahun pada bulan Juni dan Desember. dalam ilmu-ilmu perairan dan perikanan. Manajemen Sumberdaya Perairan, Fakultas Perikanan dan Ilmu Kelautan, Institut Pertanian Bogor. Jurnal Ilmu Tanah dan Lingkungan Journal of Soil Science and Environment merupakan media yang menyajikan artikel mengenai hasil penelitian dan telaah perkembangan mutakhir dalam bidang ilmu tanah, air, dan ilmu lingkungan sebagai bahan kajian utama. Jurnal Ilmu Fisika dikelola oleh Departemen Fisika, Fakultas Matematika dan Ilmu Pengetahuan Alam. Buletin Kimia mempublikasikan naskah dalam bahasa Indonesia dan Inggris di semua bidang yang berkaitan dengan kimia. Naskah dapat berupa laporan terbaru hasil penelitian, penjelasan metode penelitian yang baru, atau pengertian baru dari hasil yang telah ada. Sumbangan teoretis terbaru dapat juga disamakan dengan naskah hasil penelitian. Semua hasil yang ditampilkan dalam naskah sepatutnya lebih mendukung konsep kimia daripada pelaporan fakta. Interpretasi dari kebijakan di atas merupakan wewenang redaksi yang akan memutuskan apakah suatu ajuan naskah memenuhi kriteria atau tidak. Buletin Tanah dan Lahan merupakan media yang menyajikan artikel mengenai hasil penelitian dan telaah perkembangan mutakhir dalam bidang ilmu tanah, lahan, dan ilmu wilayah sebagai bahan kajian utama. Buletin Tanah dan Lahan diterbitkan tiga kali setahun yaitu pada bulan Januari, Mei dan September oleh Departemen Ilmu Tanah dan Sumberdaya Lahan.